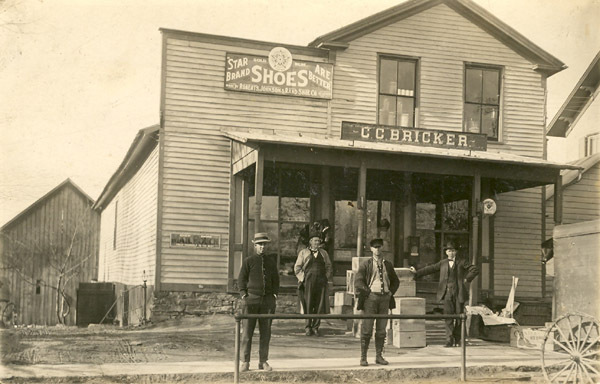 Postcard belonging to John W. Bricker shows his father, C. C. Bricker, on the left in front of his store to Mr. Kuhn. Mr. Vaughn Fuller, Bricker's brother in law, is the third from left. Bricker owned the store but sold it to a Mr. Kuhn before he went to serve in World War II. Charles bought the store again in 1926 and ran it until 1933. Later, the store was owned by Joseph Hancock (Paul Evarts’ grandfather) who sold it to Bill Trainer. The building burned down while Trainer owned it.